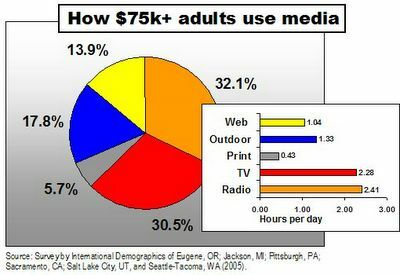 Wealthy Americans, the group most likely to be devoted to newspapers, magazines and books, spend an average 10 minutes watching TV or listening the radio for every minute they peruse print. That's what International Demographics, an independent research firm, found in a nationwide study of households whose incomes were $75k or greater, a cohort representing roughly the top 25% of the economic pecking order. Median national income is about $40k. Generally speaking, higher-income families are somewhat older and better educated than the population at large. You would figure, therefore, that their noses are stuck in the New Yorker, Fortune or, at least, the Sports Illustrated swimsuit edition. But you would be wrong. The survey of 86 markets in every state found that the average high-income respondent spent 43 minutes a day reading, vs. 2.41 hours listening to the radio, 2.28 hours watching TV and 1.04 hours on the Internet. Individuals also reported being exposed to 1.33 hours per day of outdoor advertising. It seems highly unlikely that these folks just sat around staring at a billboard puffing smoke rings over Times Square, assuming they are allowed to do that any more. So, the study has its limitations. We are left wondering: When people say they are on the Internet, are they reading the Los Angeles Times, communing on IM, shopping on eBay or looking for love? Does "radio" time include listening to Shostakovich on a CD, Stern on Sirius or Snoop Dogg on an iPod? Could you be listening to the radio at the same time you are paging through Barron's or Huck Finn? We need to do more work to determine which way the media wind is blowing. But you don't have to be a weatherman to see that it blows ill for print.